The 13th Annual Helpmann Awards ceremony will feature some of Australia’s most talented and celebrated performers. This year joining co-hosts Eddie Perfect and Christie Whelan Browne on stage as presenters will be Tina Arena, Erika Heynatz, Patrick Brammall, Chloe Dallimore, Rob Mills, Ashley Zukerman, Miranda Tapsell, John Waters and Sharon Millerchip. These presenters and more will be announcing the winners of the 43 awards recognising distinguished artistic achievement and excellence across the major disciplines of Australia's live performance industry. In addition to the star studded list of presenters, the ceremony will include a line-up of incredible performances showcasing Australia’s unique and diverse live performance industry. Tim Minchin fresh from his role in Jesus Christ Superstar and his huge success with Matilda on Broadway will be making a very special appearance on the night. The show will also feature a full company performance of HOT SHOE SHUFFLE starring David Atkins, Jaz Flowers, Bobby Fox and the Tap Brothers as well as stunning performances by talented singer Emma Birdsall and the Sydney Dance Company. 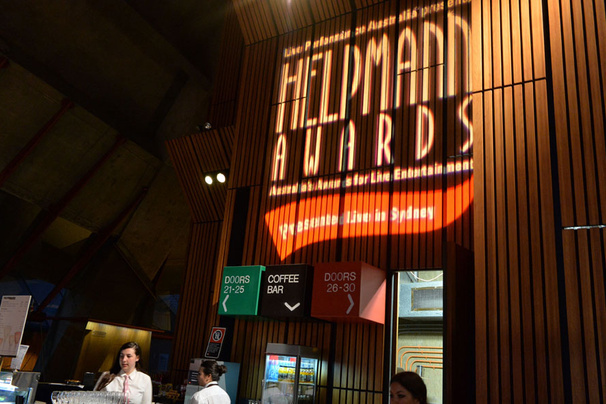 NSW Minister for Tourism, Major Events and the Arts, George Souris said: “The Helpmanns are the premier awards event for the live performance industry. Our investment in the 2013 Helpmann Awards and the staging of them in Sydney re-affirms the NSW Government’s commitment to the arts and further strengthens Sydney’s position as the live performance capital of Australia,” Mr Souris said. The NSW Government, through its tourism and major events agency, Destination NSW, is a strategic partner for the 2013 Helpmann Awards. CEO of Destination NSW, Sandra Chipchase said: "The Helpmann Awards are the pinnacle industry event for Australia's live performance industry, recognising the very best in live performances that annually attracts over 17 million people to shows across the nation with revenues of $1.3 billion." As previously announced pop music icon Kylie Minogue and Arts philanthropist David Blenkinsop have been named co-recipients of the 2013 JC WILLIAMSON AWARD with both recipients being specially honoured at the ceremony. The 13th Annual Helpmann Awards will be presented live in Sydney at SYDNEY OPERA HOUSE on Monday 29th July hosted by Eddie Perfect and Christie Whelan Browne, and broadcast on Foxtel’s Arena.